A naturally cooling and soothing herbal balm with essential oils of Eucalyptus, Rosemary, Ravintsara, and Tea Tree. 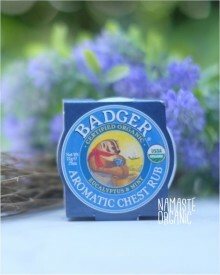 Great as a soothing chest rub, or as a steam inhalant when added to a humidifier or pot of hot water. Safe and effective for use by the whole family. Free of artificial ingredients, fragrances, dyes, parabens, petrolatum, GMOs, synthetics, or harsh ingredients. Rub it in and breathe deeply! Developed specifically for Badger Rebecca (Bill and Katie’s daughter), this balm holds a special place in our hearts – and it works! Calms and soothes to promote deeper breathing and relaxation. A must-have during winter but works great all year round! *◊Olea Europaea (Olive) Fruit Oil, *Ricinus Communis (Castor) Seed Oil, *Cera Alba (Beeswax), Cinnamomum Camphora (Ravintsara) Leaf Oil, *Melaleuca Alternifolia (Tea Tree) Leaf Oil, *Citrus Tangerina (Tangerine) Peel Oil, *Eucalyptus Globulus (Eucalyptus) Leaf Oil, *Eucalyptus Staigeriana (Eucalyptus) Leaf Oil, *Mentha Piperita (Peppermint) Leaf Oil, *Rosmarinus Officinalis (Rosemary) Leaf Extract, *Lavandula Angustifolia (Lavender) Flower Oil, *Zingiber Officinale (Ginger) Root Extract, *Thymus Mastichina (Wild Marjoram) Flower Oil . Organic essential oils contain >0.001% Limonene, Linalool, Citral, Geraniol. Why do we include this statement?